Acrobat’s catalogue features a wealth of fascinating and collectable gospel repertoire from the genre’s heyday in the ‘40s and ‘50s, and this release recognises one of the fine female singers of the era who has not enjoyed as high a profile as her work merits. She turned to gospel from classical and musical theatre in the late ‘30s and became consecrated in the Holiness Church, acquiring the honorific title of ‘Madame’. She developed her highly distinctive note-bending style as she performed around the south-eastern states and started recording in the late ‘40s for the Merit, DeLuxe, Regal and Republic labels before joining the Nashville-based Nashboro label in 1953, recording for them until her death at the age of 49 in 1967. 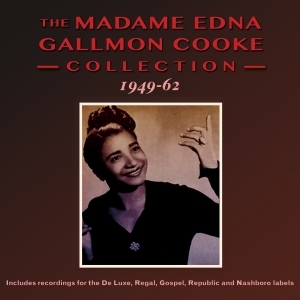 This great-value 47-track 2-CD collection includes material from all of those labels, including early tracks with the Mount Vernon Men’s Choir, with sides from many of her singles, along with tracks which only appeared on her “He’ll Fix It” and “Stop Gambler” albums from 1960 and ’61. Many of her recordings are very hard to find, and this includes a number which have not been readily available on CD.